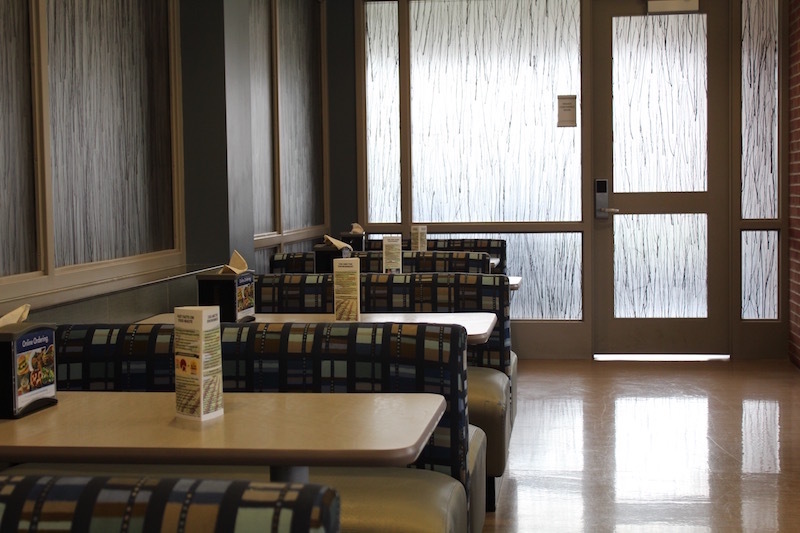 As the semester comes to a close, we were able to pull together the final stages of our project. 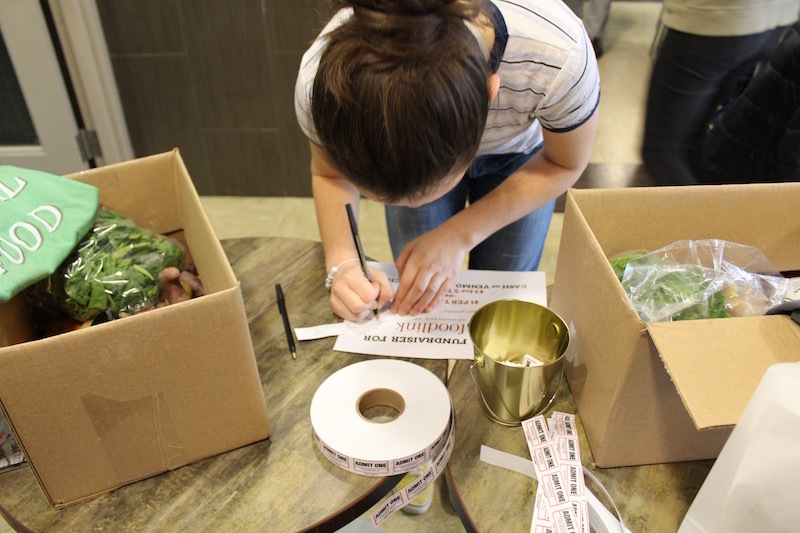 Chef Ilana allowed us to display what we have learned throughout the semester in regards to food sustainability and the impacts of food waste. 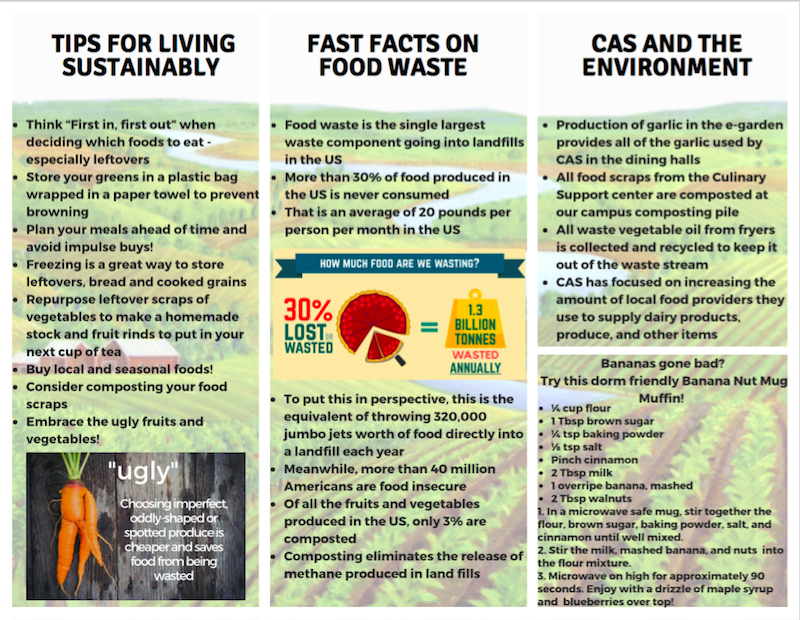 After our meeting wit Dan DeZarn we became interested in what CAS is doing to help reduce our carbon footprint as a campus. 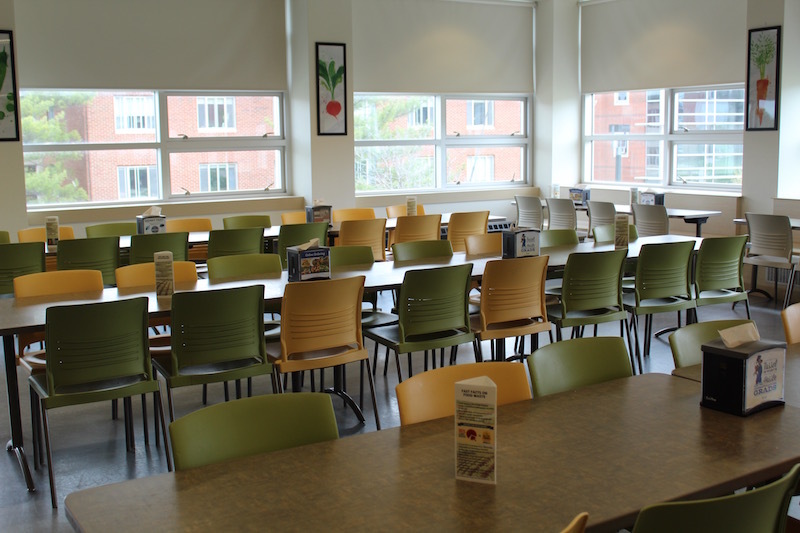 We were able to put our pamphlets on all the tables at Food Studio North in Letchworth dining complex in the hopes that students will dine while being more conscious of their consumption habits. 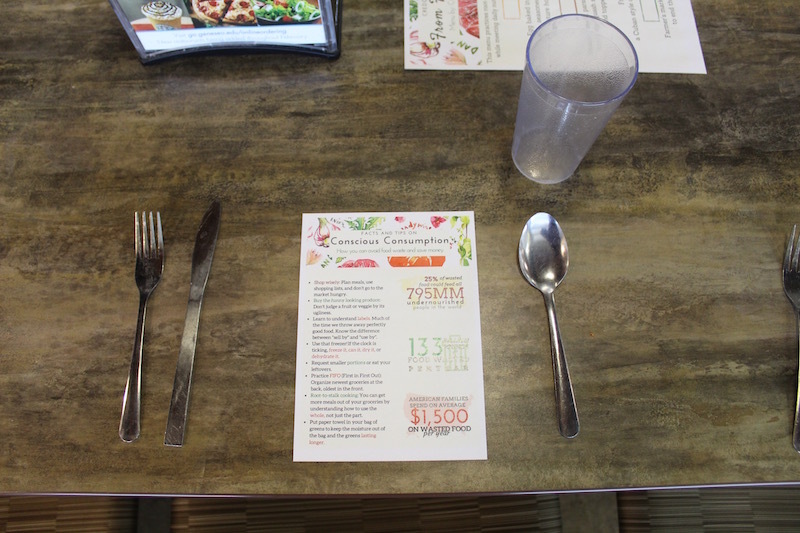 First we took to the web to design an infographic that would catch the eye of diners throughout their meal. 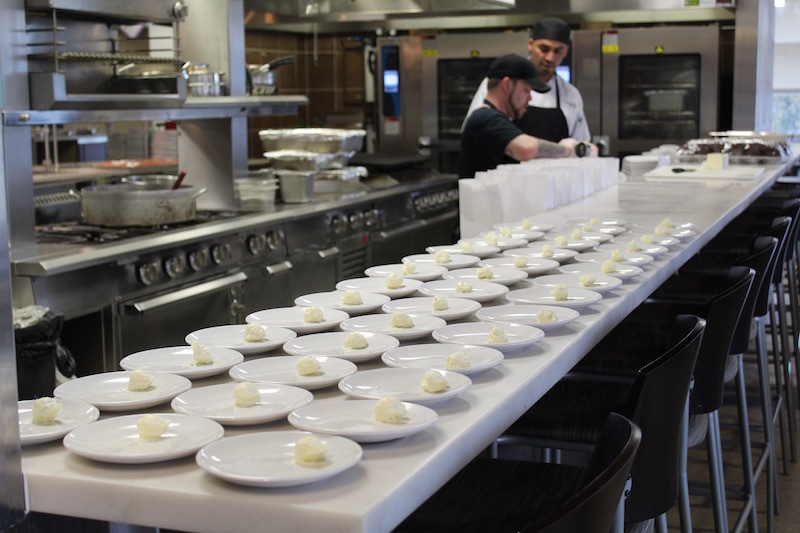 The final step was to meet with chefs in Food Studio North to help us display our creations throughout letchworth just in time for dinner that night! Bananas gone bad? 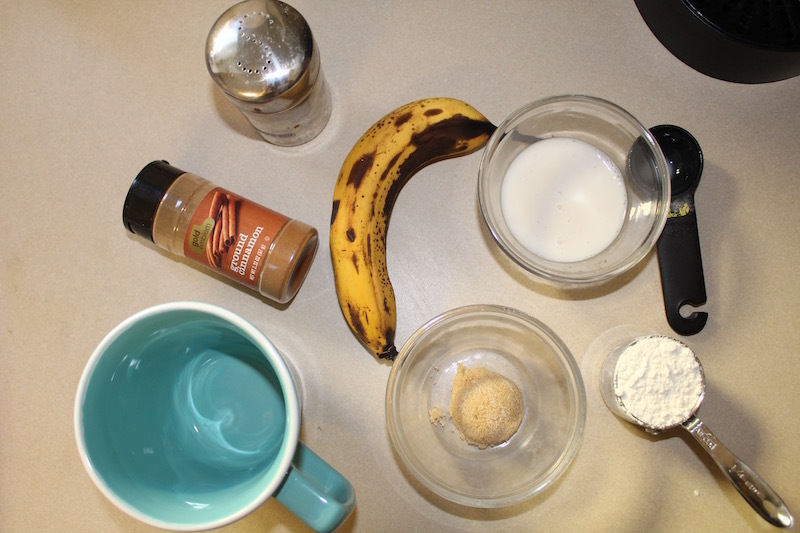 Try this dorm friendly banana nut muffin! Microwave on high for approximately 90 seconds. Enjoy with a drizzle of maple syrup and blueberries over top! Although it might not be the most appetizing meal in terms of looks, it definitely tasted good! 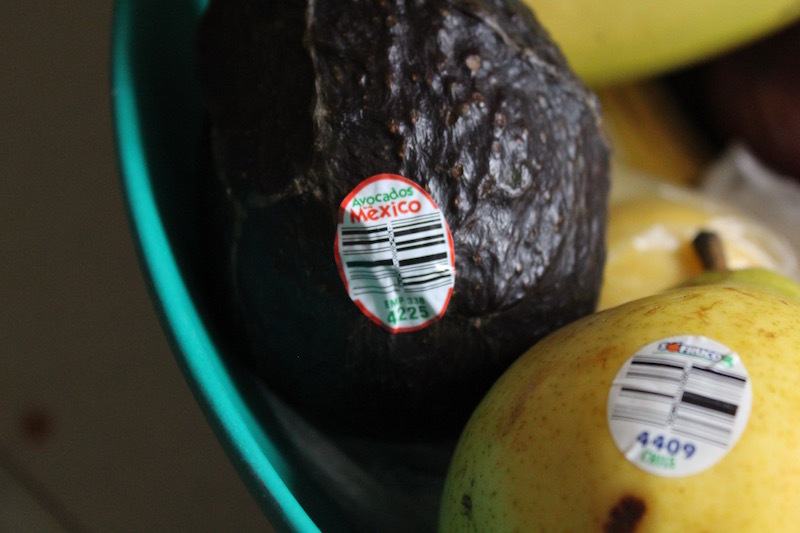 When picking up produce from the grocery store you often don’t think about where it came from. The words organic, all-natural, and home-grown all conjure up thoughts of a farm close to home. Unless you are seeking out fruits and vegetables from your local farmer, chances are a majority of your produce has come from far and wide. 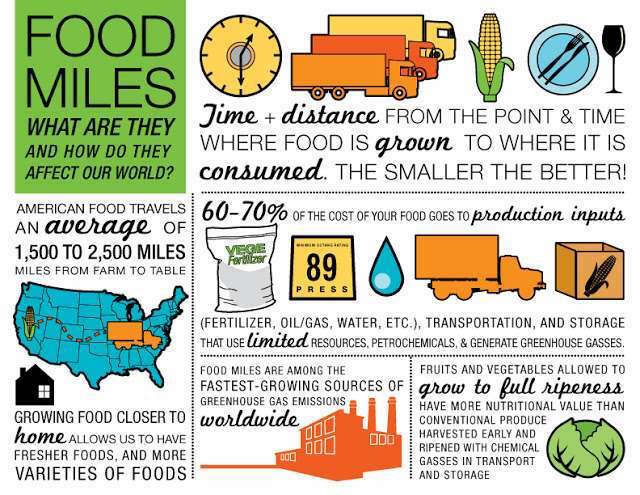 Food miles by air travel contributes to our global carbon footprint almost three-fold to travel by truck. I decided to take a look into my fridge to see how far my produce has travelled to me, and I might have contributed to global carbon emissions. I was surprised to see how far just a few of my fruits and vegetables had come to make it to my plate. In the summer it is much easier to be conscious of purchasing locally grown food, but the winter months in Upstate New York proves to be difficult in that respect. I encourage you to take a look inside your fridge to see how far your food has travelled! As someone very VERY new to shopping for and preparing my own food, I didn’t know the first thing about storing my food properly. I assumed throwing everything in the fridge would be the best way to make sure things stay as fresh as possible for as long as possible. Since I share a kitchen (and a fridge) with 4 other girls, I would try my best to stuff as many items as possible into the fridge wherever it could fit. 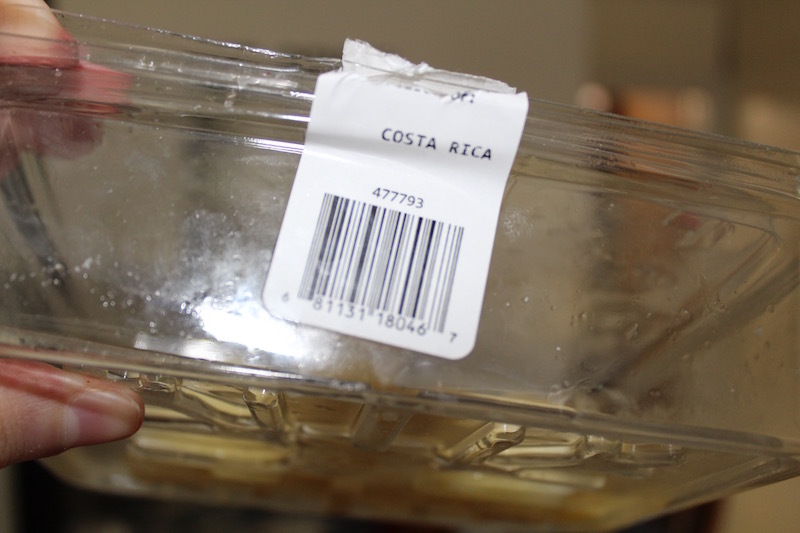 Well…it turns out that was NOT at all the best way for me to preserve my food. After beginning research for this project I learned that there are many factors to take into consideration when deciding where to store different foods and that some foods are actually maintained better outside of the fridge. 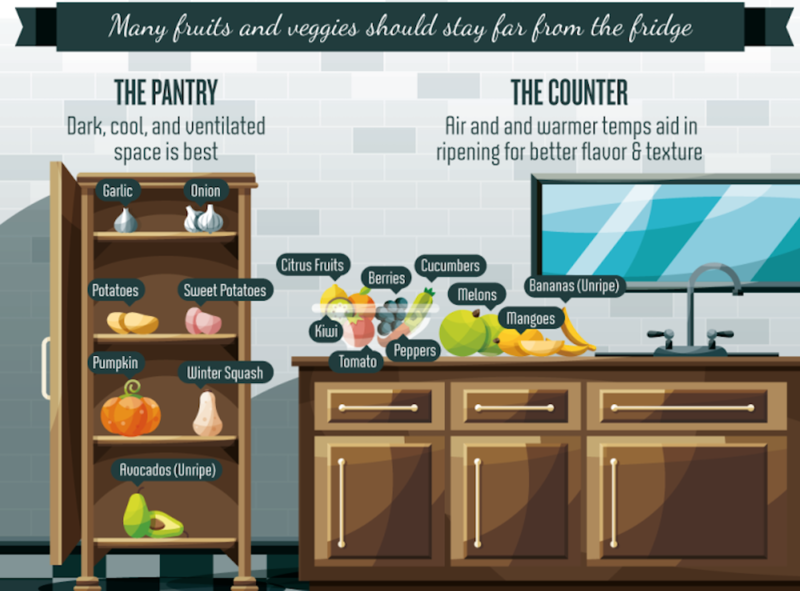 Below are some graphics that may help you – as they have helped me – prioritize which foods should get the prime real estate fridge space and which foods are better off on the counter or in the pantry. 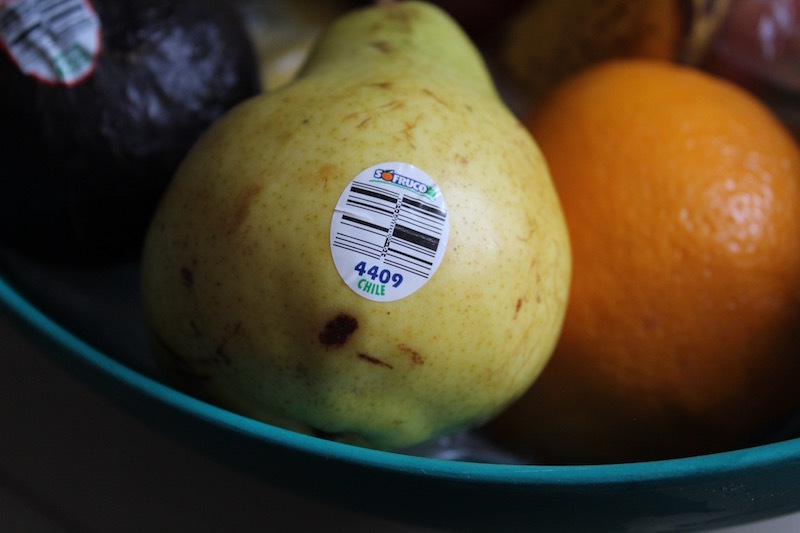 Raw meats and dairy products should be kept away from fresh fruits and vegetables to avoid bacterial contamination. If you have to choose between putting your grapes in the fridge right next to some raw beef or leaving them on the counter – definitely give the prime real estate to the chicken and leave your grapes on the counter! Jams, peanut butters, pickles and mustards can be kept in the fridge if you prefer. However, these products will be perfectly fine being stored at room temperature as well as long as they are sealed tight. 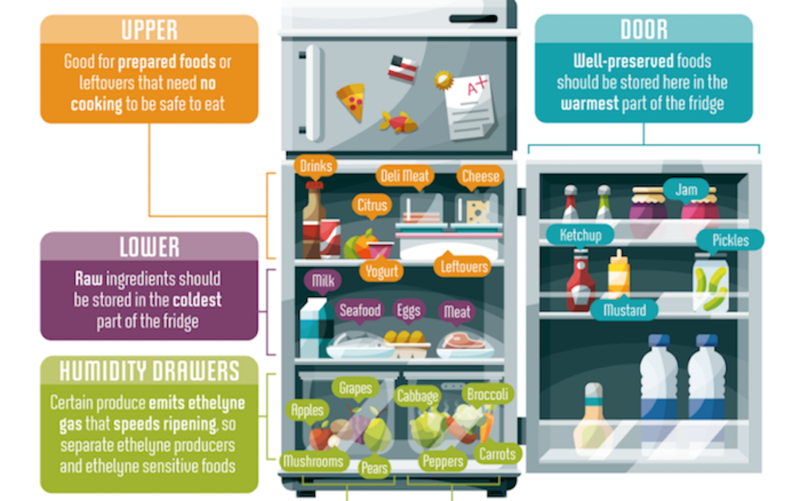 If fridge space is limited, make space by keeping these products in your cabinet! 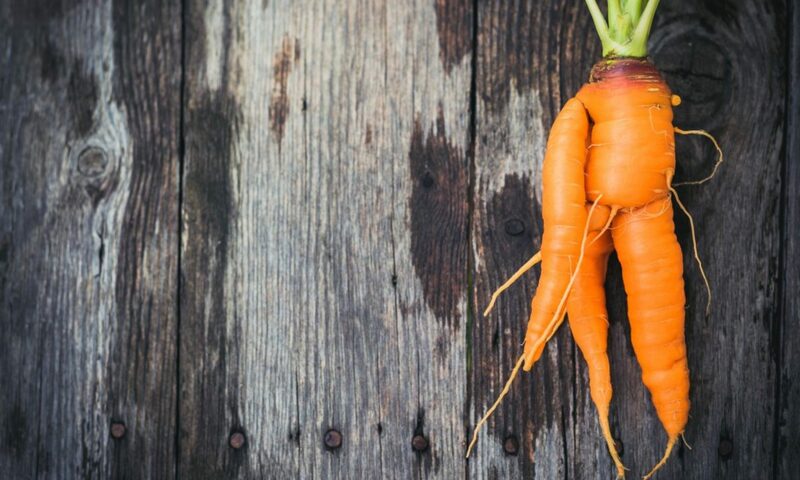 Some fruits and vegetables can be better preserved by keeping them in the fridge, such as cabbage, fresh spinach and other leafy greens, and carrots. Avocados should be kept outside of the fridge until they ripen. 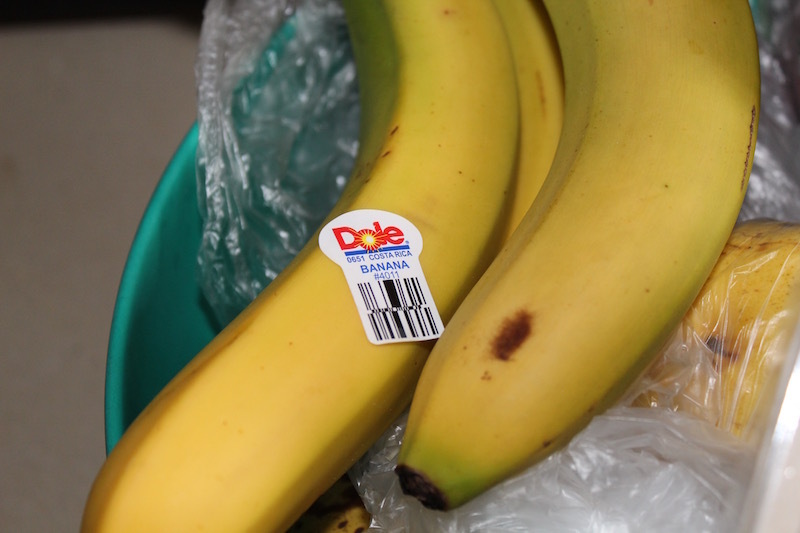 Once they are ripe they should be kept in the fridge to prevent them from getting overly ripe. 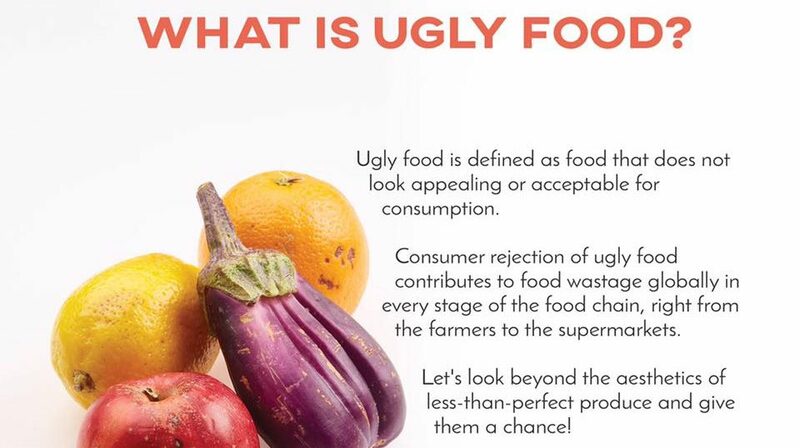 Other produce should NEVER be kept in the fridge because cold temperature can actually cause them to go bad more quickly, lose their taste or diminish their nutritional value. These include tomatoes, potatoes, melon and garlic. As I mentioned in my previous post, many fruits and vegetables such as bananas, berries and leafy greens, can be preserved by freezing them. 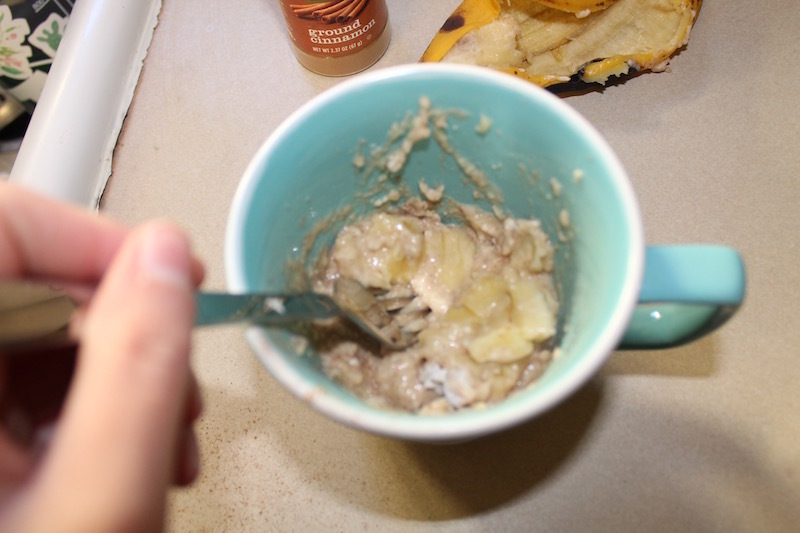 Be sure to cut up the banana into smaller pieces before freezing it so that you don’t overwhelm your blender. As you might imagine it wasn’t long before I started to crave some nutritional diversity. I was especially feeling deprived of fruits and vegetables. I was still too intimidated to cook at this point so I started making a lot of salads and smoothies with a NutriBullet®. 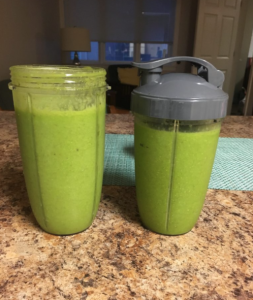 The awesome thing about salad and smoothies is that you can incorporate a large variety of different vegetables and/or fruits with very minimal preparation. 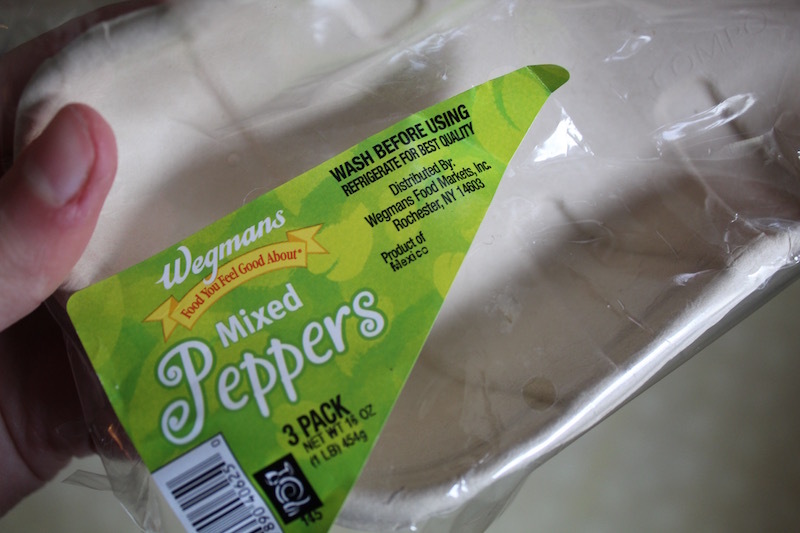 This is great news for people who don’t like to cook AND for people who want to minimize food waste! 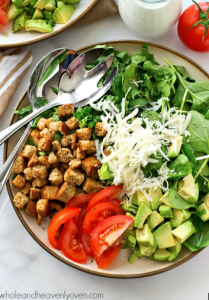 Salads are great because you can get a great variety of different tastes and textures into one meal with minimal effort! 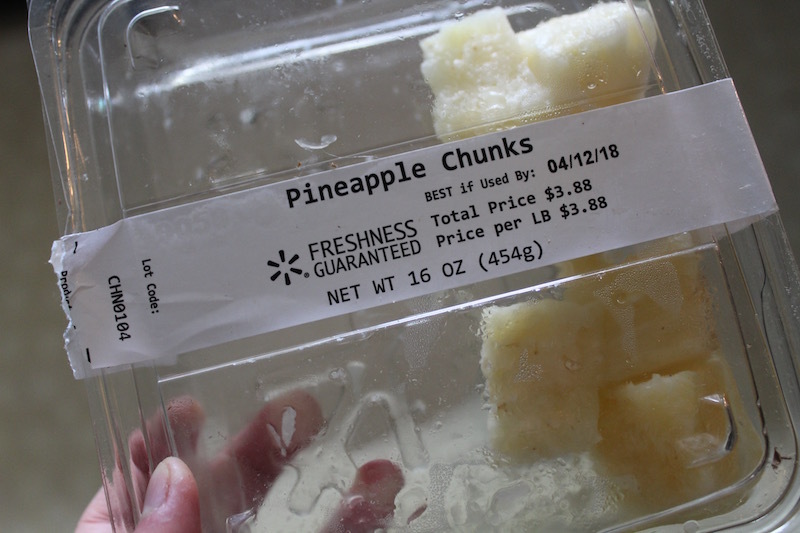 They are also a great way to use up an awkward amount of fruit, vegetables, cheese, bread or another kind of food you have leftover from another meal before it goes bad. The other great thing about them is they’re super healthy! The unhealthiest part tends to be the dressing as store-bought salad dressings can be full of fats and artificial ingredients. After quickly getting tired of simple oil and vinegar I found the motivation to make my own salad dressing. 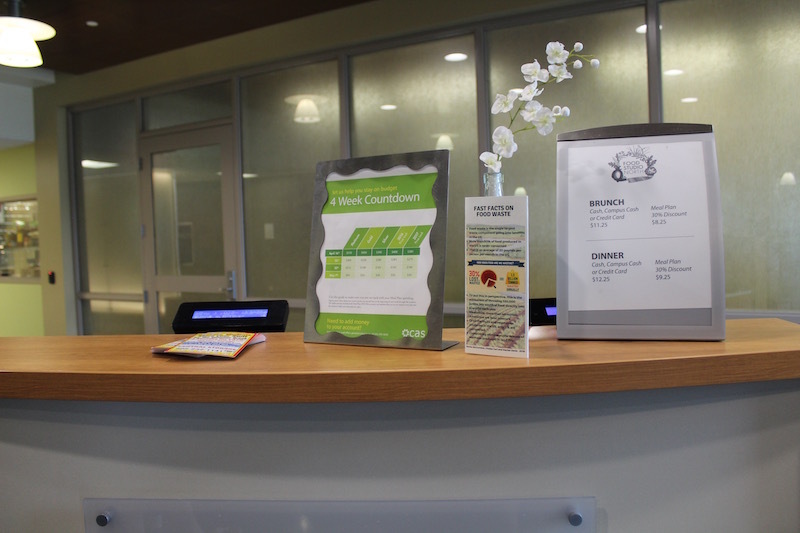 For just 5 minutes of effort you can be fully stocked with delicious homemade dressing for the rest of the month. Smoothies are delicious, nutritious and convenient – a winning trio! My blender comes with an attachable lid that turns into a to-go cup. This provides the perfect breakfast or snack that I can take with me to class or to the library when I’m in a rush. 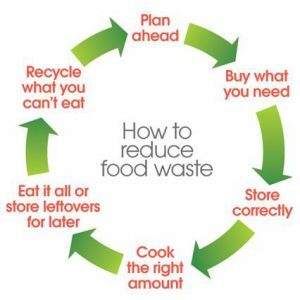 Making smoothies has also helped me significantly reduce my food waste. I love using frozen fruit in my smoothies so whenever I realize some of the fruit in my kitchen is about to go bad I wrap it up and stick it in the freezer to use in a smoothie later on. I haven’t thrown out a banana in months! We were inspired by ideas on how to incorporate all of certain foods into delicious recipes and decided to try this one out! It is very simple and easy to do. 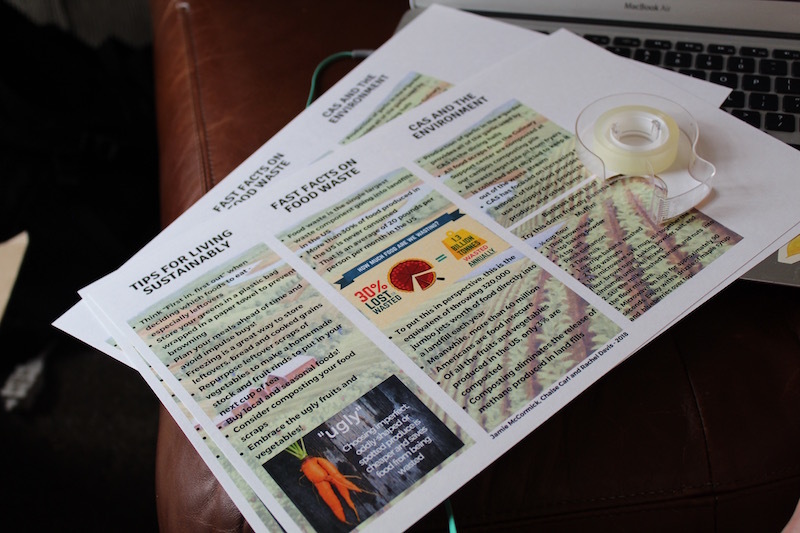 All you need are vegetable scraps! 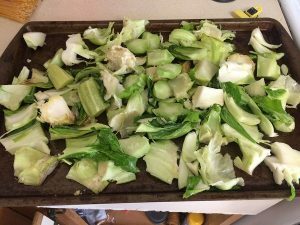 We used the broccoli stems, cauliflower leaves and stems, and cabbage scraps this time. As you can see, you just need to chop them up, drizzle a little vegetable oil, and add seasoning of your choosing (we chose salt and pepper). Pre-heat your oven to 350 degrees, place the scraps in for approximately 20-30 minutes (depending on your preference), and voila! 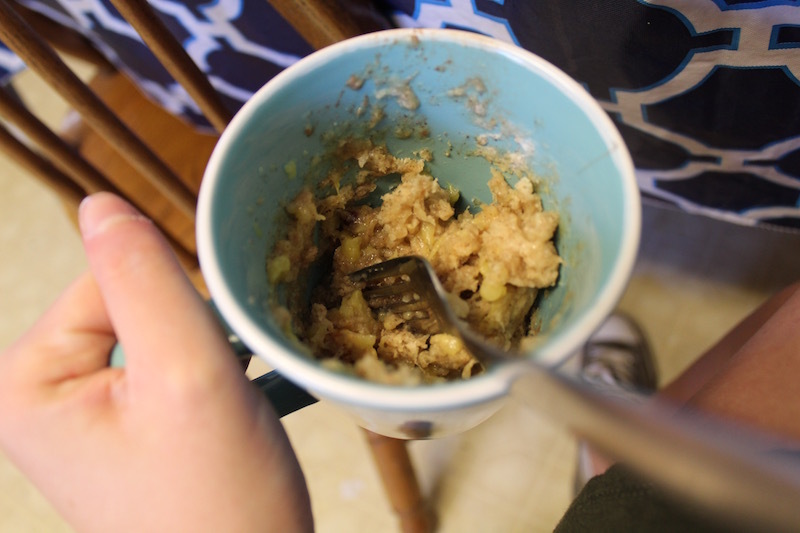 A delicious side dish to any meal, made entirely from foods you may have normally thrown away! Sidenote: there is no after picture because my housemates and I ate them immediately. 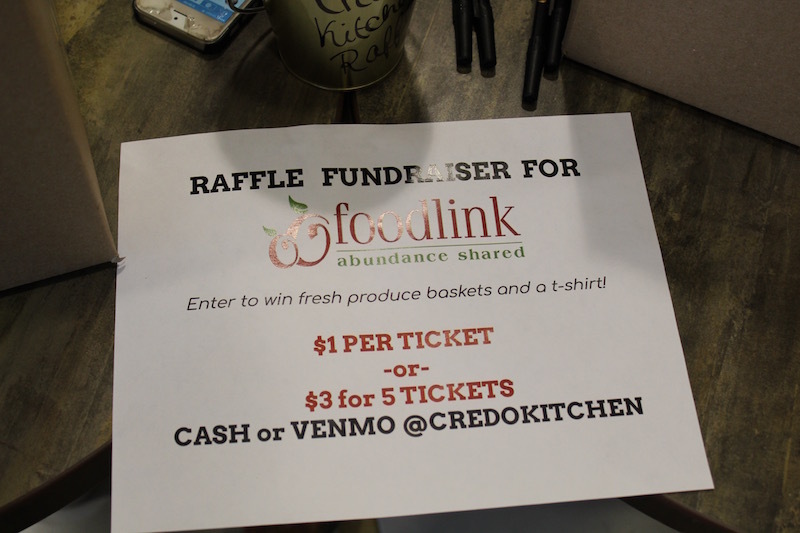 On March 28th we had the opportunity to join Sofia in her last Credo Kitchen event, which highlighted root to stalk cooking and the elimination of food waste on a budget. 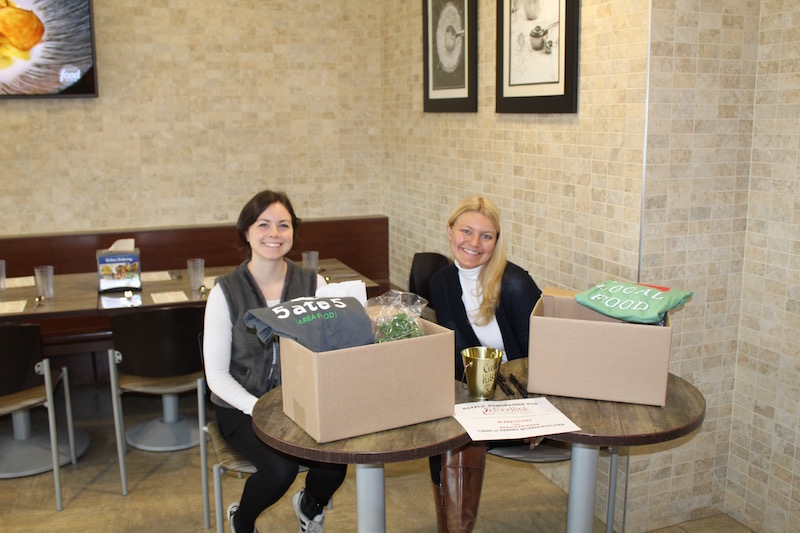 We were able to help out with the raffle and raised $50 for Food Link in Rochester! 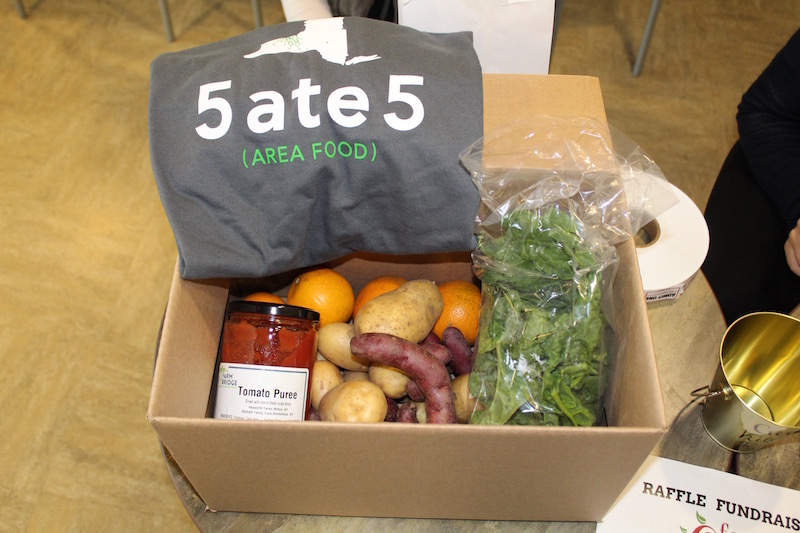 The prizes included T-shirts and produce baskets from donated by Headwater Food Hub. The preparation for the event was quick and precise, with members of the CAS team working directly with Sofia to see her vision through. The menu reflected root to stalk cooking, meaning using the entirety of the product. 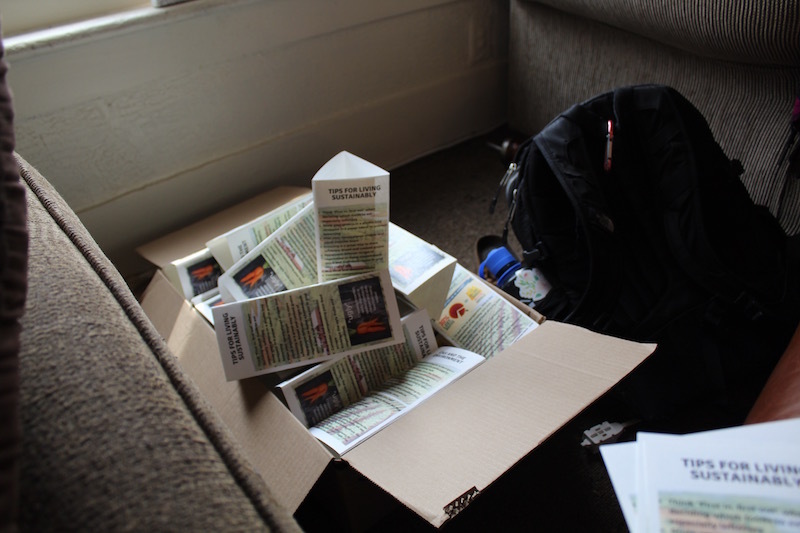 It was also nutritious and based on a budget for a family of four making minimum wage. 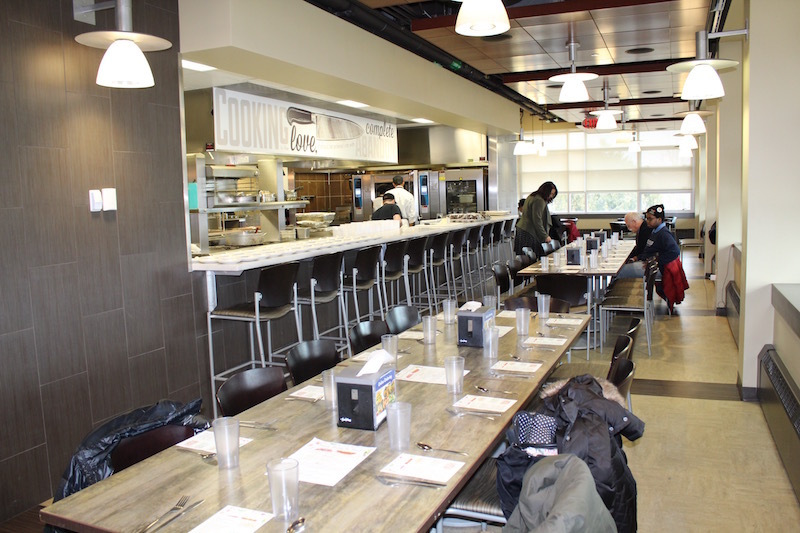 Chef Illana Stevenson created the menu with this in mind, and was able to deliver a delicious meal for 40 students, faculty, and community members. 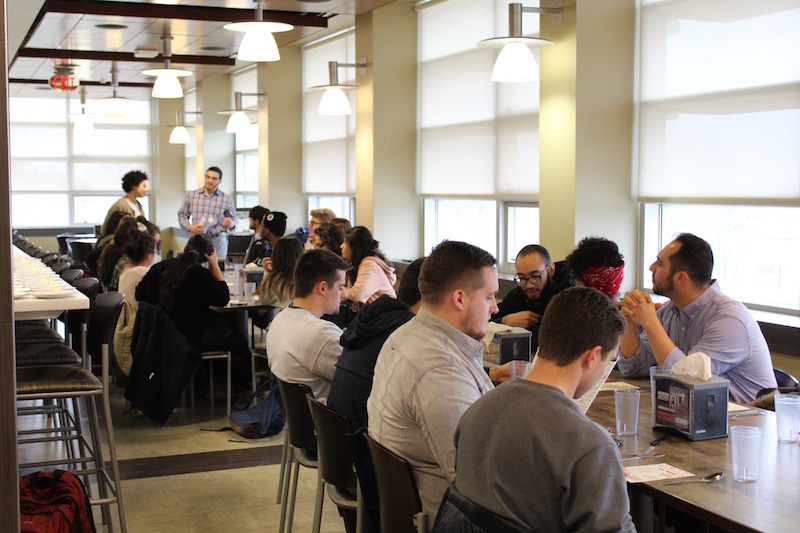 The students, community members, and faculty, along with speakers from Headwater Food Hub, were able to engage in meaningful conversation about the ways we think of food as a part of our daily lives. 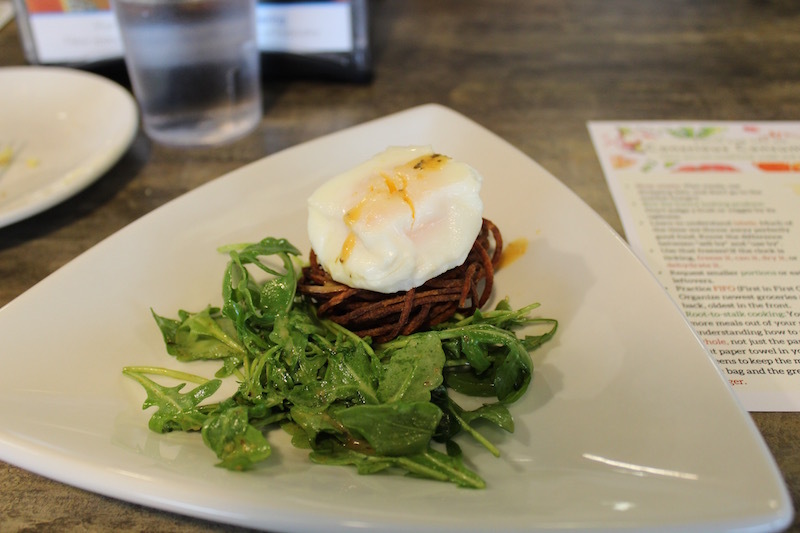 It was eye opening for most diners to see how every part of the vegetable or protein can be used to create a balanced, budget friendly meal.